Find artworks, auction results, sale prices and pictures of Lillian Marzell at auctions worldwide. 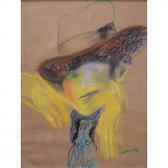 Description: Lillian Marzell, American (20th Century) Pastel on paper "Laura Mae", Signed and dated 12-5-77. Good condition. Measures 23" x 17", frame measures 24-1/4" x 18-1/4".